All of the Lawless America Movie and Lawless America Revolution friends and supporters are asked to read this article and do a few things. This is especially important for those who have been filmed or will be filmed for the movie. 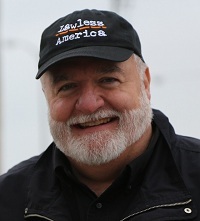 This is a very important message about Lawless America…The Movie. I need to ask you to do a few things. Please click on the LIKE button on both the article and on the video. This is very important to spread the word about the movie! Third, please send us the information that we have requested in the video, if you can. I would really like to have a Microsoft Word or email text copy of the Congressional Testimony that you gave when you were filmed (or will give). I can use pdf copies of any documents that provide evidence to support your story, and I can use jpgs of any photos that will supplement your video. I request a list of names, titles, companies/entities, addresses, telephone numbers, and email addresses of any of the people who have done you wrong. If possible, please take photos of any locations that are important to your story, and email those to me. If you have any videos, or if there have been videos of news coverage or links to online stories about your ordeal, please email links to me. PLEASE NOTE THAT NOT EVERYONE CAN BE FEATURED IN THE FILMS. Those who provide the information and the help that I request will be given priority. Lawless America…The Movie has filmed in the 48 Continental United States. Today was Day 159. I have driven over 21,000 miles. So that the government does not have a chance to interfere with the delivery of the Congressional Testimony in January, I am going to undisclosed location(s) for several weeks to process the film so that the Congressional testimony videos are ready to present. I will be sending those to several people so delivery will be ensured even should something happen to me. Please click the LIKE Button to subscribe to LawlessAmerica on Facebook. And if you aren’t checking www.facebook.com/lawlessamerica daily, you are missing information and interaction that should help you. Please click the LIKE button on everything. MAINSTREAM MEDIA COVERAGE FOR LAWLESS AMERICA: OKAY ALL YOU FELLOW NOBODIES AND LAWLESS AMERICA REVOLUTIONARIES, PLEASE RECOMMEND THIS ARTICLE, TWEET IT, AND EMAIL IT TO AT LEAST ONE PERSON. We need to make this the most recommended article to appear in this newspaper! Please join the Revolutionary Party by mailing one penny with your name, address, phone, and email to: B. Windsor, PO Box 681236, Marietta, GA 30068. The pennies will become part of a monument. Our Proposed Legislation needs to be enacted -- http://www.lawlessamerica.com/images/stories/GRIP/state%20legislation%20proposal-2012-09-26.pdf I will be updating this video in the next few weeks.